Lexus Enthusiast editor Kevin Watts was invited to participate in an immersive media event with the Lexus LC and music producer Mark Ronson. Here’s the story of his adventure. Pulling aside a black curtain, I find myself in the middle of a Spanish wedding. The bride and the groom are happy to see me, calling my name, ushering me over for a group photo. I have never met these people before, and will likely never see them again. But right now, we’re all family. A groomsman passes me a Lexus key, guiding me outside to a white LC 500h coupe parked outside the chapel. A technician magically appears to make sure I’m comfortable, powering up a suite of cameras dispersed around the car cabin. When I look up, the wedding party and all the guests have lined up in front of the LC. They break into song and dance, encouraging me to join in the clapping. I give myself up to the absurdity, slapping hands as I drive away down the road. 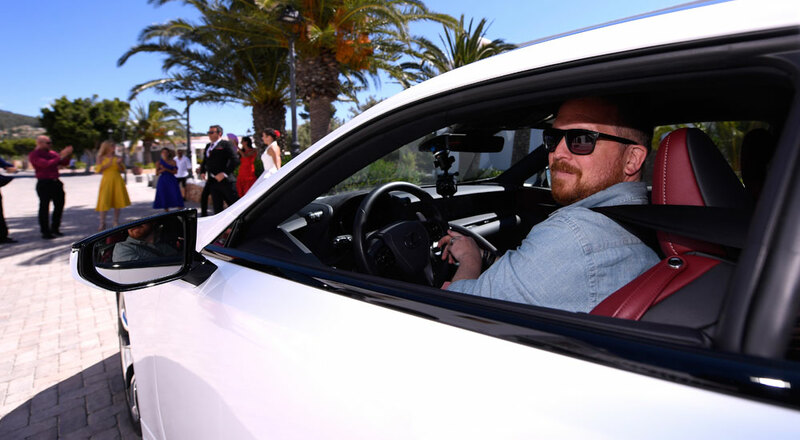 Lexus has been investing heavily in immersive media events for the past couple years. It started in London with a theatre experience starring Jude Law, and was followed by a bigger photography masterclass in Miami. And now, it’s an event in Ibiza, Spain. The original email invitation was near opaque, with only a mention of the Lexus LC and the new collaboration with producer Mark Ronson. Would it be a concert, with Ronson driving on stage in the new coupe? A private recording session, guitar lessons? I will admit to some reservations, with my main concern that the LC is transformed into a prop in a wild lifestyle party, a background element to some unrelated story. Less than five minutes into my experience, and never have I been happier to be so wrong. After leaving the church, I drive a kilometer down the road before two pedestrians flag me down. I hesitate for an instant, but their matching rave outfits are a pretty clear indication this is no car-jacking. Sure enough, an invisible boombox starts up the minute I stop the car, belting out a music track for another dance display, all pop-lock and beats. The momentary twinge of awkwardness I felt leaving the church disappears, and I forget all about the cameras and the business, intent to enjoy the spectacle that’s unfolding before me. 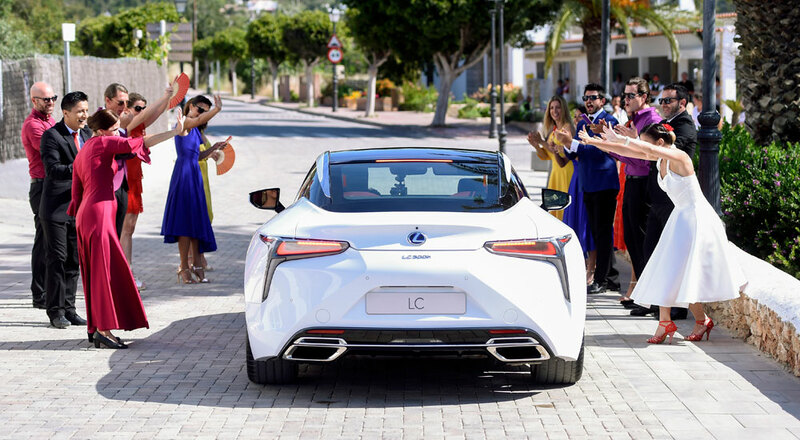 This Ibiza experience is about more than just the drive, with the preceding days a portrait of the customer Lexus expects to purchase the LC. We spend time lounging at the pool and getting massages, dining in suites overlooking the island, exploring the night life until the small hours of the morning. It doesn’t take long for reality to fade, for the excesses to normalize. It’s an education I enjoy to the fullest, and not just for the obvious reasons. 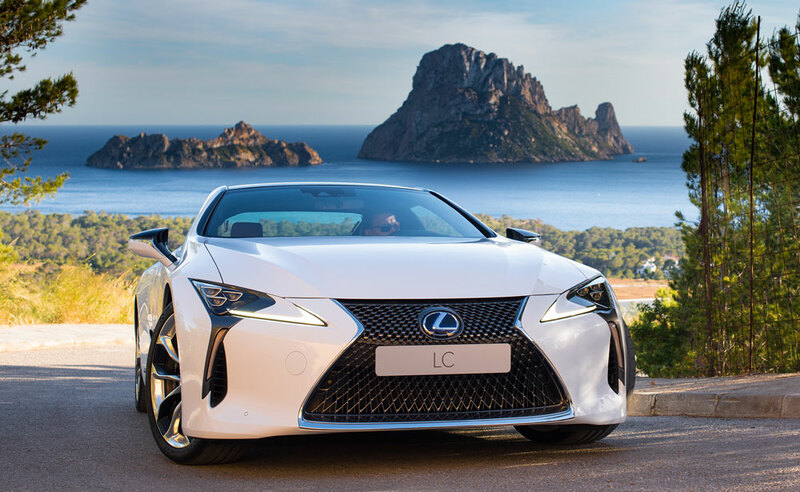 Assessing the Lexus LC on the merits of its engineering is one thing, but after a few days in the Ibiza sun, a $100k coupe just feels right, you know? It’s now that the road opens up, the scripting falls away and the car comes to forefront. This is the second time I’ve driven the LC 500h in Spain, and the coupe is a natural fit for these roads — the 3.5L V6 hybrid drivetrain syncs perfectly with the gradual elevations and deep corners. And then I come across a police road block, and my speed suddenly seems like a very bad idea indeed. In my mind, I know this is part of the experience. When the policeman asks for my papers, I remember the little pamphlet I was given before I started driving. I notice the road crew in front of me, the work site too tidy to be functional, the construction workers too handsome and happy to be real. Even so, I’m immensely relieved when they break out into a STOMP-style dance around the LC, banging their traffic cones and oil barrels, leaping through the air with flips and jumps. It concludes with the officer waving me through the checkpoint. I later learn he was real police, and that I was also one of the fastest through the route. Talk about dodging bullets. “What we wanted to do, using the LC as the foundation, is immerse this audience in the values of our new tagline “Experience Amazing“. The drive ends at a small beach, where I’m escorted out of the car by a girl named Strawberry or Blossom or some variation on that theme. It’s a beautiful setting, a private alcove complete with beachside huts and those giant red & white umbrellas you expect . The entire place is packed with people, and they all spring out of their deck chairs at the sight of me. Music surrounds us, and there are dancers diving everywhere, cascading around me in a circle. For a moment, I’m transported into the movie Grease, to that final number at the amusement park. There’s simply too much action to track, and I’m struck by the preparation, the audacity of the experience. These dancers have repeated this routine hundreds of times, and yet it’s full of life, fresh and exciting. But what does this all mean, beyond an exclusive experience for a handful of journalists and influencers? What was the purpose? 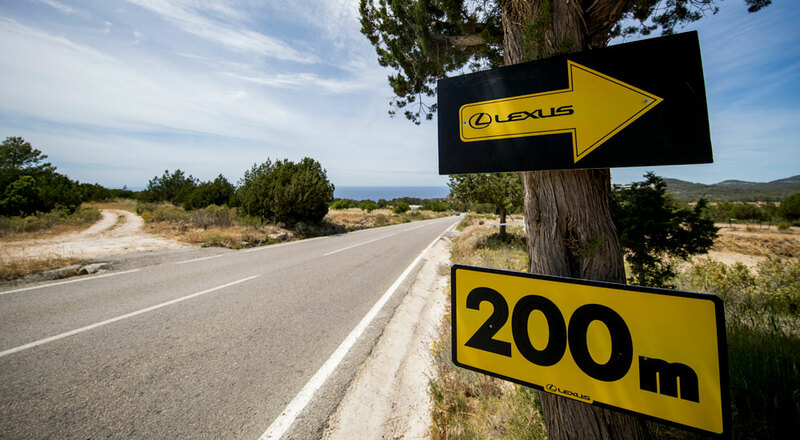 In building this extravagant luxury experience, Lexus has exposed its own ambition — Ibiza town, multi-million dollar villas, $100k coupes, private beaches, the business of leisure. This is right in the center of where Lexus aims to position itself, a portrait of exactly where they want the LC to exist. As an enthusiast, nothing has to convince me to visit the dealership. My loyalty is set, built on a foundation that took years to develop. I see the future as a succession of escalating vehicles — from a CT to the IS, then maybe a GS or RX, followed by an LS or LX, everything capped off by an LC. It’s quite possible you have a similar path in your mind, the possibilities all mapped out. But this is not how most people work. It’s now a world of lifestyle, where every purchase decision is based on the narrative that people tell themselves. There’s no room for brand loyalty, with future promise taking the place of past success. With the new tagline Experience Amazing, Lexus has codified the essence of their vehicles and applied it to the entire brand. The attention to detail, the level of craftsmanship, the design experimentation that I’ve come to expect from modern-day Lexus, it was woven throughout every facet of this event. 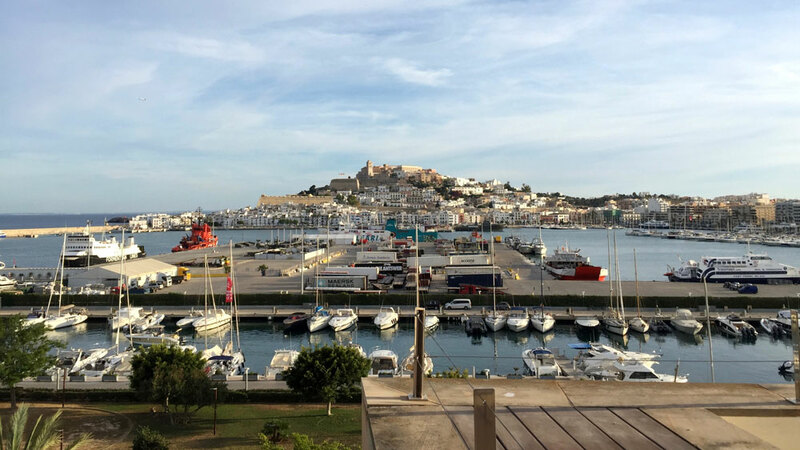 I arrived to Ibiza with a healthy skepticism, and left with a renewed sense of purpose. More than ever, I’m confident that Lexus is back on track after years of continual reinvention. The Lexus story has returned to its roots, the only thing that’s changed is the scale. Special thanks to Lexus Europe for the invitation to attend this once-in-a-lifetime event, with a special shoutout to MT @ Lexus Europe and Jack Howells from Freuds.